I chose a specific combination of tiles to give the space a personal feel. Playfulness and openness go hand in hand with this palette, and materials stay fresh and young that way. 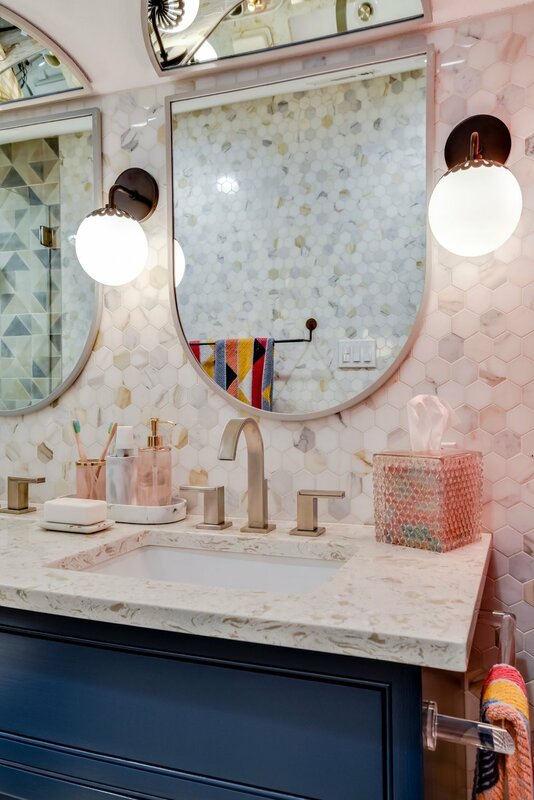 Marble tile from floor to ceiling, helps ensure the spaces luxe quotient go way up, and gives the space long-term appeal. And when it comes to making a place for three growing girls, my aim was to inspire each of their personalities with touches like the fabulous flamingo pink tower – it skillfully encourages them to keep things organized and well-stored. Overhead space is often forgotten. The key, therefore, was to creatively approach this slanted ceiling. This I did, by using wonderful enamel mirrors in a favorite and typical Turnstyle, unusual juxtaposition. 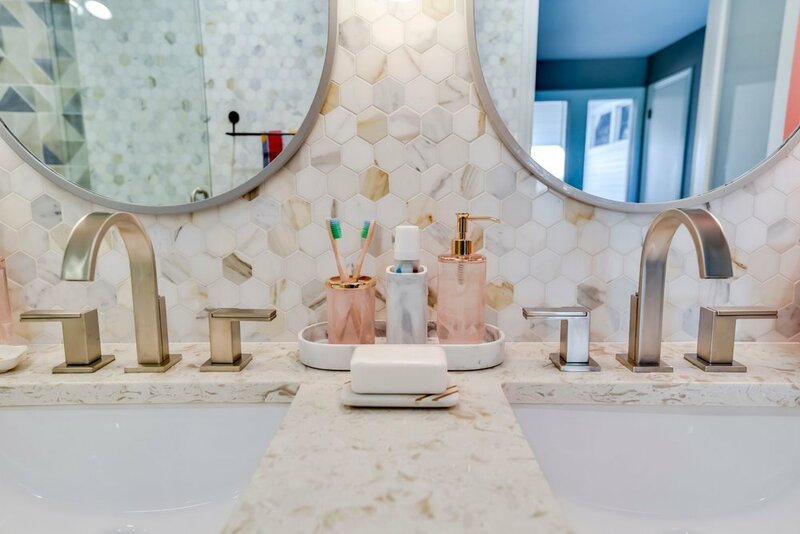 The wow moment that comes from them not only improves the space in feel, but also through the mirrors’ reflections, shows off each of the design’s details, highlighting the nature of my chosen materials. 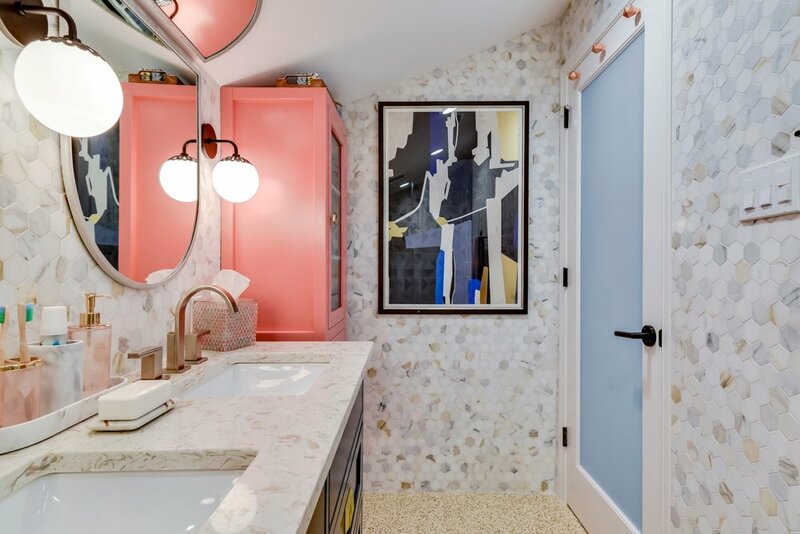 Terrazzo floors keep things easy to clean and the new walk in shower – created where there was previously a built in bath, leaves these girls feeling more organized and grown up. Clearly ready to tackle any day.